A lot of times, I like to have fun with my nail art and do something very unexpected and unusual. 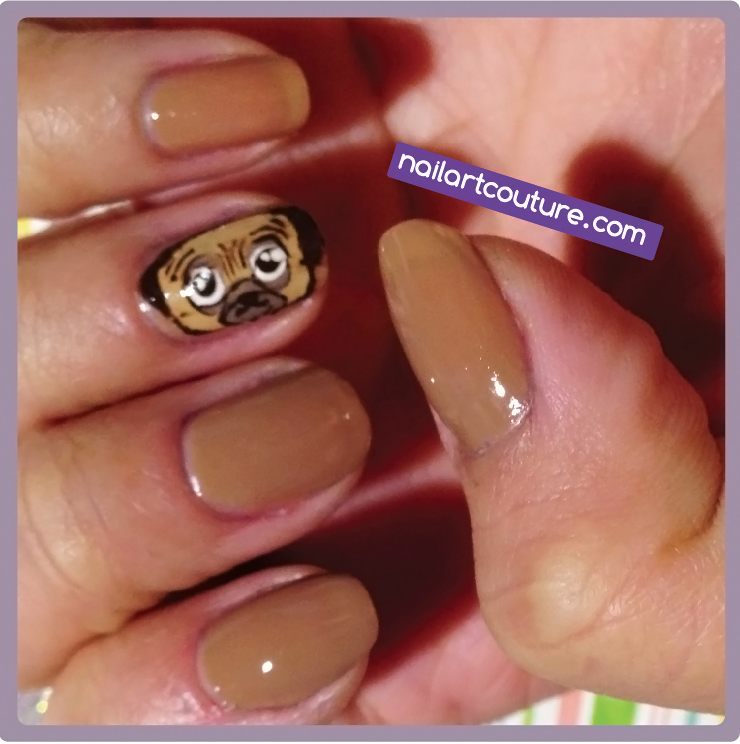 This nail art was inspired by my friend Amy's new baby pug! 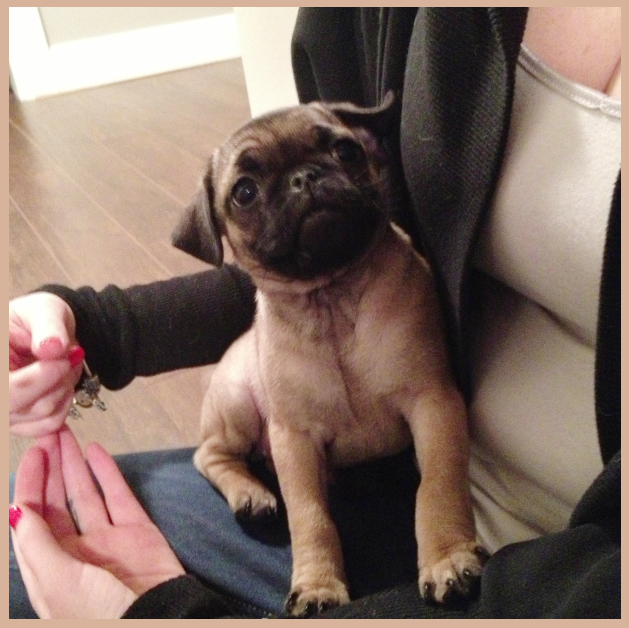 She recently purchased the cutest little pug and when she brought it home with her, my friends and I bombarded her for a visit. I was never a huge pug fan since I like my dogs fluffy and white. 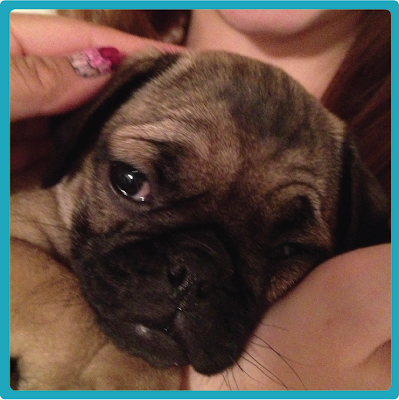 But when I saw her little puppy pug, I instantly fell in love. I want a puppy so bad, but I feel like I'm not responsible enough to take care of it yet. Ready for epic cuteness, keep reading after the jump! You've been warned. Prepare to squeal because the pictures are going to be cute! I told Amy that I would create pug nails for her in celebration for her new pup. I didn't know how I would do it, but late last night I decided to experiment with different techniques, hence there is only one pug nail and no tutorial pictures. The technique that worked for me was using the tape nail decal method. Basically, I planned out how the decal would fit on my nail by drawing a oval similar to the shape of my nails, like the picture below. 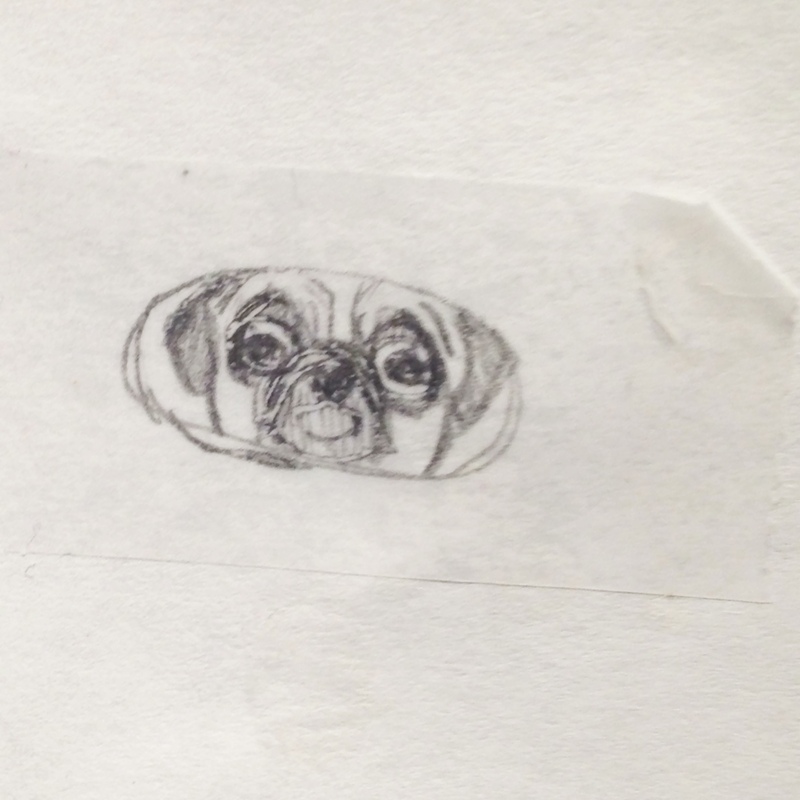 Then I drew the image of a pug using cartoon references that I found on google. Next, I place a tape on top of the drawing and start applying different color polishes on top of the tape, using my pug drawing as my guidelines. Once I have achieved all the details of the pug with a very fine nail art brush, I would allow it to dry for about an hour. Since I didn't apply thick coats of polishes, I was able to peel the decal from the tape fairly easily. Normally if the polish is very thick, you can wait up to 3 hours. You can use a tweezer if you need to, but remember not to squeeze too hard or else it would ruin the decal with nicks. Finally, carefully place the decal on the desired nail. For me, I used my decal as an accent nail. Seal the decal on your nail with top coat and allow it dry. I promise if I use this method again, I'll be sure to create a picture tutorial with it! I hope you enjoyed this nail art. Isn't she the cutest? I love her perma-frown! She doesn't have a name yet and it's been a week since my friend brought her home. Any suggestions? I think she's been calling her Snorlax or Molly. I really want to call her Tofu! But yes, please throw out some names and I'll pass it along to her and see what she likes. Update: Her name is Molly! OMG this post is exploding with cute! Amazing job! LOVE IT LOVE IT LOVE IT, sooo cuteeeee <3 i really looove it :( I want a pug and this manicure too! !